Be The Blogger You Always Wanted to be Using Simple and Effective Tactics You Can Setup in Less Than 90 Minutes! Are You Ready to Make a Difference and Send Your Blog Business to The Next Level! There are hundreds of millions of blogs online and thousands coming online every day. What chance do you stand to make your blog stand out from the rest? What if I was to let you into the secrets I use to help you create a successful blog? A blog that will generate traffic, earn you an income and make you an authority within your niche would you be interested? If the answer is yes, please keep reading as I will reveal the perfect formula for creating a blog and a blog strategy that works. 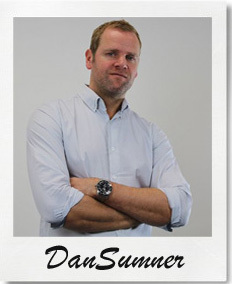 This is me Dan Sumner, just a regular guy, nothing special in any way from you or anyone else. Apart from I make an online income and that gives me the freedom I need to spend time with my family and enjoy life.. I'm not a millionaire, I don't have a private jet, you won't see pictures of me in hired Ferrari's, I'm just a regular guy who stumbled on some online income secrets that I want to share with you. Allow me to ask you a question? It's Called The 'Rat Race' and I'm Guessing You Want Out! Since I started my first blog in 2006 I must admit, I never made much of a difference. I never made much of an impact at all to be perfectly honest. It wasn't until I figured out what I was doing wrong and took notice of the people who were doing things right, I eventually started to see success. For a lot of people, and I’m talking about 99% of blogs online when I say this. They will never succeed in creating a successful blog. Some will never even get a comment other than comments from friends and associates who are trying to help out. This may sound harsh, but it’s true. Blogging is a skill and it requires a strategy to make it work. Creating an engaging and successful blog doesn’t happen over night. I’m not going to say to you follow me, this time tomorrow, you will have the perfect traffic generating blog which will make you an income so you can quit your job. I was in the same place as you were. It took time for me to build my blog strategies to find out exactly how to get the traffic, comments, build community and build subscribers and income. What Did I do to Create a Blog That People Wanted to Visit? I started to study the blogs that were working for others. I subscribed to the mailing lists of the blogs that were making a difference. I learned all the tricks of the trade to create community and traffic. I learned to build subscribers and keep them coming back. I knew these fellow bloggers had been doing it right for a long time, I knew they had a massive advantage over me. I knew it was going to be a hard task to accomplish. But this never stopped me from studying their techniques and blogging tips. In short, I set out to make a difference. I read blogging eBooks and reports on how to increase my following, I joined mailing lists and courses on how to become a better blogger. Then one day it started to finally happen for me. The Traffic Came and so Did Subscribers! My methods were starting to pay off and I was finally seeing some progress from my blog. My knowledge was expanding and so was the following I had. People were visiting and even starting to comment. Don’t get me wrong here, I wasn’t grabbing 100’s of hits per day not by any stretch, but I was getting traffic and I was buzzing with excitement. I can’t explain that feeling you get when you finally start to see results from your own blog creation. It really is amazing! The Comments Came and Things Were Starting to Move Forward! Then I Made More Changes! The list goes on and on. I spent a long time testing what was working and what wasn’t and what was best for my blog and my visitors. Some techniques worked some didn't. It was a huge learning curve to get over! I asked for advice on what to do with my blog? Sometimes I got the advice I needed, sometimes I got the brush off but this didn't phase me at all. Now I See Results That I Never Seen Before! I won’t stop there either, I will continue to work on my formula and grow my blogs. Blogging has become a passion, a life changing element which is not just a business. They allow me communicate with others, provide information which helps create community and earn an income without the hassle of working for someone else. 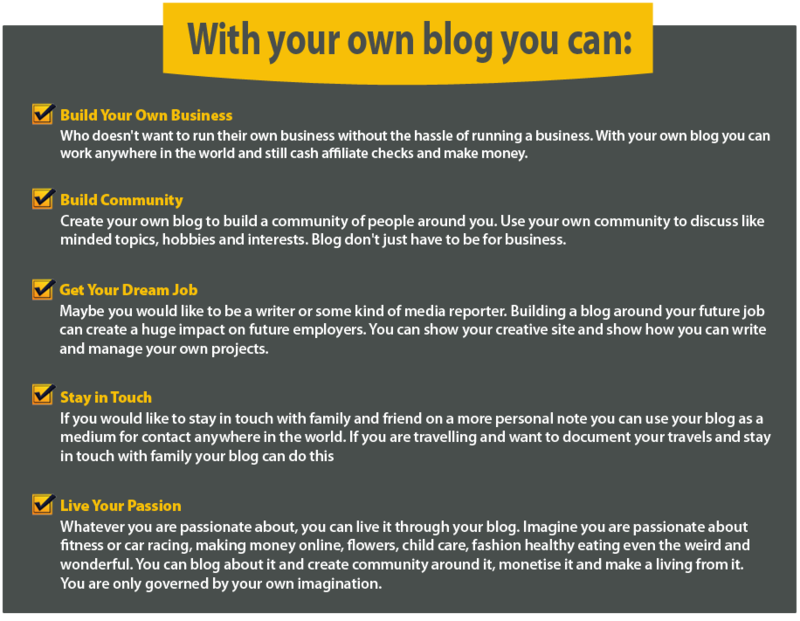 So Why Should YOU Start Your Own Blog? Blogging can be so much more than an expression of your interests in your chosen subject. Blogging can be a gateway to an income. Your blog can be utilized as a tool for creating an income and easily become a full time business. Why make that sickening trek to work everyday through the rush hour traffic, buying coffee because you can't stay awake, dealing with people you don't want to talk to and being nice to your boss because you have to. Is this really what you want? Or do you have a dream like I did? Why do all of this when you can start your own blog or blog empire and create an income your boss could only dream of. Your dream is only a step away! Seriously it can happen for you and it can happen today. All you need to do is want it enough to start. You don't have to leave your current job, you can start a blog at home in your spare time for only a few hours per week. Right now you may be thinking that starting a blog sounds like a great idea. You can build your business, create raving fans, monetize and reap the rewards. But what the heck can you blog about? Most Bloggers DO IT ALL WRONG.. Most 'so called bloggers' simply put up a new blog, add some ads or some Google AdSense, some hacked PLR content and expect their blog to make it to the big time. Is it really this easy? No it isn't, it's damn hard unless you now what you are doing. You may be thinking about that marketing course you joined and the so called guru guys have showed you how to build a blog so it's all good right? Wrong! They may have showed you how to get a blog online, but did they show you how to create content? Did they show you how to create an audience, get traffic and build engagement? Be honest to yourself.. Did they? The truth is most people start a blog and don't know where to go from day 1. They see the next big thing and are sold promises of mega riches in 'X' amount of days or something crazy like that. What really happens is, they see no comments, no traffic and no revenue, literally nothing at all. So just like that they quit with ill feeling that none of their invested time or money worked. 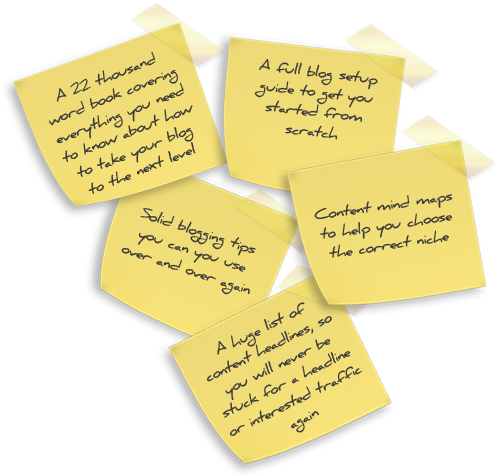 What Can The Bloggers Roadmap do For You? I want to take you by the hand and prevent your blog from becoming one of those faceless, redundant blogs with no traffic, no comments and no revenue. Above you can see the core fundamentals of the Bloggers Roadmap. Over these 11 huge chapters and over 22 thousand info packed words, I will explain to you in detail the exact process to blogging success. I guarantee if you follow this formula you will become a successful blogger in what ever niche you decide to follow. The Bloggers Roadmap is a complete step by step guide of over 22 thousand info packed words covering every angle of blogging. 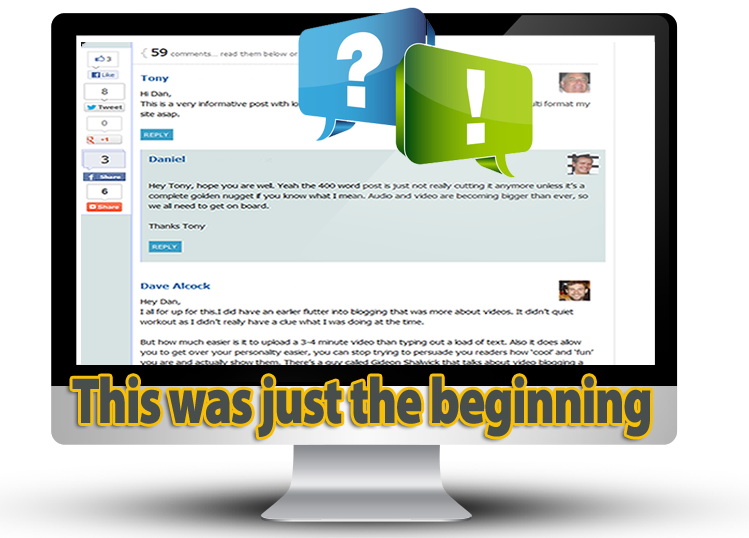 There is no stone left unturned in this amazing Book which will show any current or new blogger how to get the best from their future blogging business. These are just some of things I will teach you when you invest in the Bloggers Roadmap. Thanks to the amazing formula I have created, you can now create a blog that really works.. 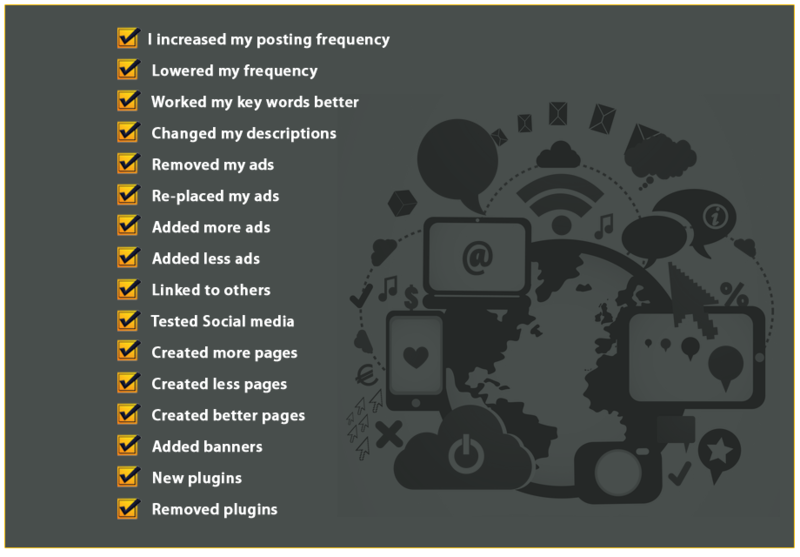 Inside Bloggers Roadmap I will show you step by step the exact methods I used to create my blogs and how I still maintain that today. No stones will be left unturned as I reveal my most closely guarded secrets for the very first time. I will explain everything in great detail to ensure you learn exactly how to create and benefit from the Bloggers Roadmap, that is guaranteed! Will You See a Return From Your Investment? It is important to be honest, in fact I base my marketing business on honesty and helping people succeed online. 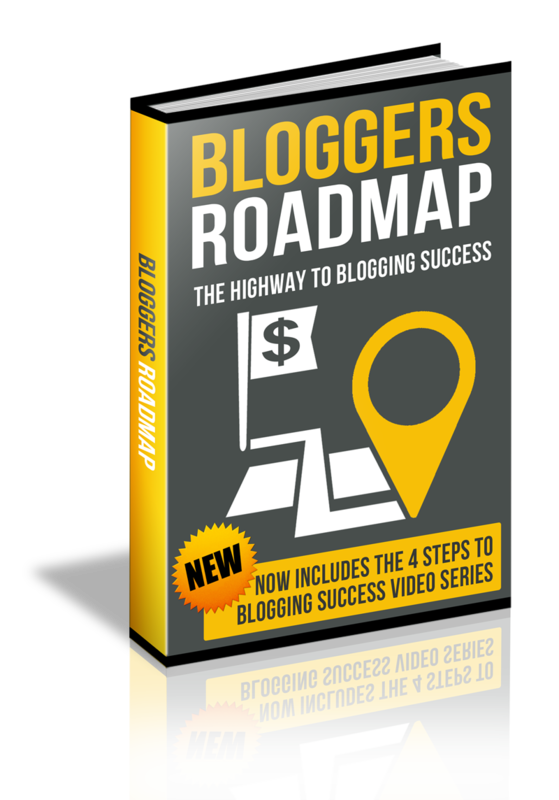 The Bloggers Roadmap is no different it is absolutely jam packed full of value and will fast track your blog to a successful business. So in answer to that question “Yes you will see a return on your investment”. This is an awesome book containing 1st rate information from over 12 months of research and study. This is a step by step fully integrated book that is full of amazing value to help you start and create the blog you have always wanted. My mission is to help people make a better blog and give as much of my knowledge as I can back to the passionate ones who want it. I'm not crazy I simply want to show you how to be the best you can be within your blog business. For one low price you will receive a complete 22 thousand word info packed book. This book will take your blog to the next level. In this exclusive interview we discuss our top 10 blogging tips to success! 30 Day no Questions Asked Money Back Guarantee! I know this works. But you might be skeptical and that’s perfectly normal. I get that. So you can come on board, apply my blogging methods and judge for yourself. If, for whatever reason, you want your money back just let me know before the 30 days is passed and you’ll get a no quibble, no questions asked refund. I will give you a complete refund no matter what the reason. Because that's how confident I am that this will work for you just like it's worked for everyone else who's followed these simple blogging steps. In short - Everyone who follows the steps get results. YES – I Want a Blog That Works! YES. Please give me immediate access to “The Bloggers Roadmap” and "Blogging 4 Steps to Success" today for a single low investment. YES. I understand I am short-cutting thousands of hours of painstaking research, trial and error by getting my hands on this proven blogging method. YES. I want immediate access to this groundbreaking strategy right away so I can start applying it today and finally start blogging and generating an income. There is no risk whatsoever and I should grab The Bloggers Roadmap RIGHT NOW for just a small, ONE-TIME, ONE-OFF investment. 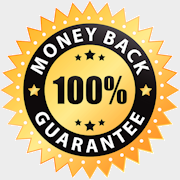 I understand I have a FULL 30 Days Money Back Guarantee, and nobody is allowed to ask me anything or try to pitch me something else if I decide to ask for my money back. I look forward to hearing YOUR success storys, now you can finally start creating the blogs you have always wanted and start to make a real business from your blog and blog's to come. I look forward to hearing about your success. P.S. You are one click away from breaking through right now. When I started trying to learn how to blog and make serious income there wasn't anything like this training program to help me. Sure - there was information out there, but I had to find it. Now you don't have to. I have provided all my tips trick and research into one handy, simple to read, easily explained report which you can invest in today for one low price. You can get the simple, step-by-step method right now and immediately breakthrough to creating a blog and a business that works..